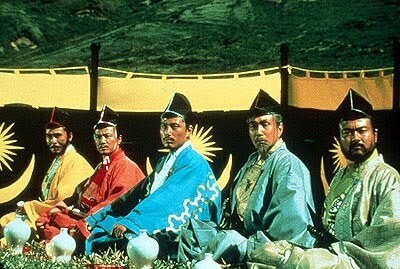 This past Wednesday, Nathaniel and I continued the plunge into our brand-new fandom: the films of Akira Kurosawa. For our second foray into the work of the internationally famous Japanese filmmaker, we watched Ran, which came heavily recommended by several friends. "Ran" isn't a very descriptive title for American audiences. What is the movie about? Alex: Well, after watching The Hidden Fortress, what with all of its walking around and falling down hills, going into this one I thought, well, okay, so maybe at least they'll be walking faster. Seriously, though, folks, I think it might actually be easier to tell you what the movie is not about, since I managed to lose the plot a couple of times along the way. Basically, there's an old clan leader, Hidetora, who has three sons. In a dream, the warlord recieves a vision that leads him to step down from his position of power. This shocks his three sons, Taro, Jiro, and Saburo, and the rest of the Ichimonji clan. 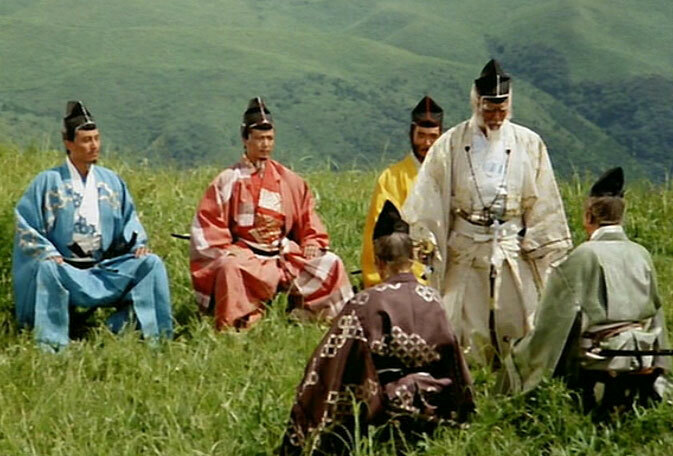 The warlord gives his seat to his eldest son, Taro, and banishes Saburo after he argues his father's decision. From there, things get very ugly. 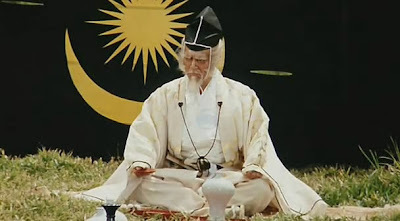 Taro's wife, Lady Kaede, immediately pushes the once-obidient son to force his father into a submissive role in the new clan structure. Hidetora, of course, finds this to be insulting, and while he signs a contract pledging his loyalty to Taro, the former leader promises never to visit his eldest son again. 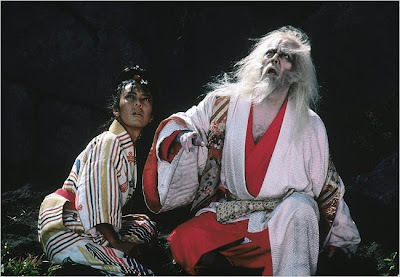 Hidetora seeks refuge with his middle son, Jiro, but finds him to want nothing more than power of his own. Jiro plans to use his father to become more powerful. Hidetora recognizes this, and leaves. When he and his men venture across the countryside, they find that Taro and Jiro have cut off all supllies. With no other course of action, Hidetora leads his men to the abandonded castle of his banished son, Saburo. Shortly after their arrival, Taro's army and Jiro's army meet at the castle and a massive, bloody battle ensues. *SPOILERS* Taro is killed early on, and Hidetora is left to commit ritualistic suicide. However, because his sword breaks while fending off the advances of Taro and Jiro's men, he cannot do this. Instead, he walks from the grounds of the castle--into the wilderness, and into madness. 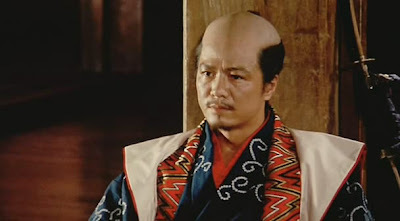 The remainder of the film deals with the former leader's growing madness, and the power struggle between the now-broken clans of the three sons. Nathaniel: What he said. Isn't the movie supposed to be a retelling of Shakespeare's King Lear? That's what the back of the DVD case said, and the box is never wrong. Were you confused at any point in the movie, or did it all make sense? Nathaniel: I do really well with convoluted science fiction plots, but as soon as I watch a movie where swords are involved, somehow things just stop making sense. Maybe it's because the people who carry swords are usually wrapped up in political intrigue and complicated family matters. I understood what was going on with Hidetora and his three sons, but as soon as blind men and concubines and people with suspiciously American-sounding names like "Sue" got involved, I started to lose track of them all. Alex: I wasn't 100% sure who Sue was, and even though she was barely ever on-screen, she played a major role in the plot development. So, that made things a little tricky for a bit. Overall, though, I think I got the gist of things. On a strictly visual level, what did you think of the film? Alex: While this film was epic in nature, in a lot of ways, Kurosawa filmed this on a smaller scale than I expected after viewing The Hidden Fortress. What I mean is, there are many more intimate character close-ups throughout this film than there were in Fortress, and that adds a whole new element to the film. That said, things opened up during the first and last battle scenes. 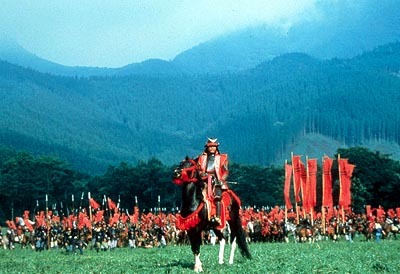 But, Kurosawa made the (effective and powerful) choice to focus in on certain aspects of each battle. So, the scenes alternated from grand scale to small, intimate scale. And I think that worked quite well. Also, the excessive blood during the battles was used symbollically, of course, but as big, red splashes tend to be, the blood was visually striking and interesting. 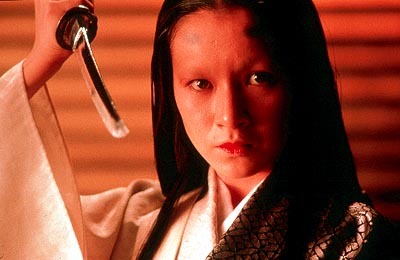 It reminded me a lot of Frank Miller's 300 film, actually, in the artful and un-real depictions of blood. Very effective, though. Nathaniel: Yeah, they decapitated someone at one point, and as they did so the camera cut away to the peoples' shadows on the wall, which were suddenly covered in about 17 gallons of blood, as though the dead person had just exploded. I'm not at all into gore, but that was a very neat, albeit gross-tastic, effect. The first thing that struck me about the film was that it was so colorful. Not just, "Hey, it's 1985 and we can make films in color now" kind of colorful; all the major characters had very distinctive and brightly colored wardrobes, and I actually referred to the brothers as "Brother Blue" and "The yellow brother" more often than not. The colors blended quite artistically in the battle scenes, but even on the simplest level, it was much easier to identify who was who because everyone was color-coded for your convenience. Like Alex, I was expecting more wide-open camera shots; I much prefer sweeping landscapes and gorgeous architecture over people and costumes. However, even though I missed the camera work of The Hidden Fortress, there were a few really neat shots, and I can see where people who really appreciate costumes and close-up shots would like this style better. How does Ran compare to The Hidden Fortress? Alex: Well, there's not as much walking in Ran as there was in Fortress. Nathaniel: No, but there was a lot more running and charging. Actually, Ran didn't surprise me as much as Fortress did. Whereas Fortress did a lot of surprising things with stunts and dialogue and camera work that seemed so unique for its time, Ran rarely caught me off-guard. Of course, that could be because I don't watch many epic/war movies and just assumed that everything that happened was pretty normal. How does Ran compare with American films in the same or similar genre? Nathaniel: Jeez, Question Man, weren't you paying attention just now? I don't watch many epic/war movies. Go ask Alex. Alex: I actually commented on the fact that the film just looked more American than I would have imagined. And I don't know if it's a matter of American films ripping off Kurosawa, or if the director was becoming more influenced by American films. Either way, I thought it had a more Western cinema feel to it. This movie came highly recommended from a whole group of people. Did it live up to your expectations? Alex: I think that I've managed to build these movies up so much in my head that nothing could meet my expectations. The battle scenes were amazing, and I guess I just figured that the entire movie would be a battle scene. Also, the length of the film--almost three hours--really took its toll on me. Nathaniel: Ran was what I was expecting from a movie of the genre (in that there were huge battles and lots of exposition), but it wasn't what I was expecting from a Kurosawa film after having seen Fortress. As I mentioned before, Fortress did things that were surprising and impressive to me considering when the film was made; for the most part, Ran didn't instill that sense of awe in me, perhaps because the impressive stuff was a lot more subtle. The aspects of the film that have received such great praise are certainly deserving of it, but I personally don't have the same appreciation for those aspects as others seem to. Alex: This one's easy. That first battle was just epic and bloody and incredible to look at. Music played over the scene, and the viewer doesn't hear the actual battle. Very striking. Nathaniel: Ditto, except what sticks out in my mind is how Hidetora sat in stillness as arrows sped past him in a room that was on fire. I liked how the old ruler was so completely detached from everything for so much of the movie; it was always interesting to guess whether he was alive or dead, in shock or insane. Also, it was visually striking how the brother in yellow unexpectedly got shot in the back with an arrow that landed dead-center in the emblem of the sun on his outfit. Poetic. See? There are parts of the movie I liked! Fortress is just more my style, that's all. Nathaniel: The pacing of the movie felt slow to me; many of the scenes were quite long, and there wasn't a lot of motion in some of those scenes, which didn't help. Alex: Um, I guess I'd have to say the length of the movie. I'm just a modern film kinda guy, and anything over that two hour mark becomes tedious for me. Unless it's The Dark Knight, of course. Fanpeople of what genre/fandom (other than Japanese film fans, obviously) might be most interested in this film? Alex: Fans of Frank Miller's early work, with all of its Japanese-inspired art and story. 300, Ronin, his Wolverine mini-series, even a lot of his Daredevil and Elektra stuff, too. Nathaniel: Is The Lord of the Rings an okay answer? I mean, Ran is a sweeping epic with lots of characters, a thick plot, and a lot of build-up to the action. Plus, there are talking trees. In Lord of the Rings, I mean. Was it better than going on a ghost hunt? Alex: Depends. Would there have been more action scenes during the ghost hunt? Nathaniel: Wait, that was one of the options? Whoa, that was a close one. Those long, silent scenes are actually supposed to be a holdover from noh and kabuki. Their more modern counterpart is the anime scene where it cuts to a quiet yard with cicadas, the pond with the bamboo fountain that plops, or the cold glass with an ice cube that suddenly clinks. Sue is actually a Japanese name; it's just pronounced differently.